Dayparting is one of the easiest ways to lower cost/conversion and boost performance, especially when you're managing dozens of campaigns. In Automate, you can schedule a task to pause campaigns on the days or times that historically perform poorly. Getting started is simple, just choose the set of campaigns you'd like to daypart, then select your schedule. 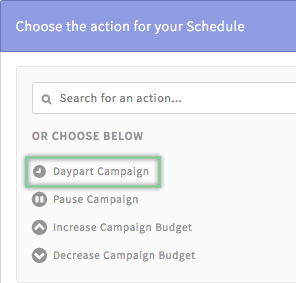 AdStage will automatically start and pause your campaigns during the days/hours you select. What are some common ways to use Dayparting? Only run ads when your business is open: create a dayparting schedule around your business hours. Engage potential customers when they are able to contact you. Weekend Ads: Traffic heavier on the weekends? Maximize your ROI by only showing ads on Saturday and Sunday during the busiest hours. How do I set up a Dayparting Schedule? Step 1: Navigate to Automate and click Scheduling. Step 2: Click Create Schedule. Step 3: Select the Campaigns level. Step 4: Select the Networks, Accounts, and Campaigns you'd like to daypart. Step 6: Select Daypart Campaign. Step 6: Select the time zone and start/stop time for which you'd like this schedule to apply. E.g. If you would like the campaign to run Monday - Friday, 8am - 8pm, then you would use the "Weekdays" option and set the times accordingly. Status doesn't matter – if a campaign is added to a schedule, it is assumed that it should be 'Active' during the times specified, so the system will change it to 'Active'. You can manually pause the campaign, but the next time the schedule runs, it will pick back up and switch to 'Active'. Need some help getting started? Check out our Dayparting Template here.